This is my latest product first offered on 3-18-2011. 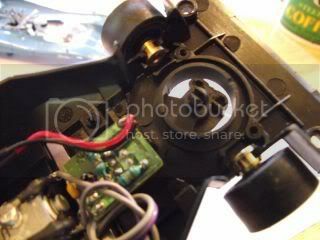 GM-2 Carrera and SCX to Slot.it Guide Modifiers. These are available direct for $6.00 you get two YOU GET TWO RESIZING RINGS AND TWO MODIFIERS, enough to complete two cars, CNC machined from black ABS. Guide modifiers for Carrera, SCX and practically anything you can drill a 3/4 " hole in will accept a Slot.it clip racing pickup CH26 or similar. After making my popular Scalextric to Slot.it modifiers, I had many requests for the same to modify Carrera and SCX. These work on any of the new Carrera cars with self centering guide and all SCX I have come across. For those reading, these adapters for Carrera cars are superb. They take very little time to install and will accept a variety of guides, though the guide opening may need to be opened up a bit for some. I use Ninco spring loaded guides on my Sport track and am slowly upgrading all my Carrera cars with this adapter. Even on cars that have no real problem on my track, the incorporation of a properly sized guide has made the cars seem to run with greater smoothness. I have adapted one SCX car, a Corvette running SCC wheels. It was a real challenge to get the adapter to fit as the external ring had to be installed from the inside due to clearance issues. Much grinding away at internal chassis bits was needed to get it to fit properly. In the end, it was worth the effort as this is a wood track car and really needed the benefit of a deeper Slot.it guide. I've not yet tried it on other SCX cars as the Carreras are my first priority. do these fit the ninco guides without modification? i seem to recall that the ninco guide post is thicker than slot it's post. Bit tight. I used a 3/32 drill bit (I think) to ream it out a tad. If you are concerned about getting things too loose, then you can use a circular file instead. I've just converted two Carrera cars with these adaptors. A great product. Converted a willeys and a chevelle. The best part is that the guide height is completely adjustable. So if you change out the wheels and tires for something different and the front tires/wheels are riding too high (or low) this adaptor allows you to set the guide height just where you want it for tire/wheel contact (or not). The adaptor fits so snuggly in the ring that I haven't even glued them in yet you can set the height, drive the car around for a bit and go back and adjust the height and try it again. Nice, I gotta get a few more. The Ninco guide posts are a little bigger so I compromised on the hole size. They fit through the hole and rotate but they are a little snug. I like them snug. If I went any bigger with the hole they would be to loose for the slot.it. I agree with Scott a 5/32 drill is the next size up drill or a small round file will loosen them up to your tastes. I've installed this guide adapter in several Carrera and one SCX Nascar. I have also used an unstandard method in Carrera McLaren Can Am cars and a Capri buy filling in the guide hole with flat styrene and cutting out a new hole further forward. This allowed me to use a straight axle instead of the independent ones in the car from factory. JB Weld is my adhesive of choice when installing these adapters. I generally use Slot.it guides but I have also used SCX Pro guides. I am very happy with the outcomes of all of these adapters I have installed. They make guide relocation projects relatively quick and painless. Nor Cal Mike any chance you could pm with the details on how you modified the guide for straight axles as I was going to ask Bnova the same thing but if you've done it I would love to see pics if possible. I will have to order some of these for my carrera cars if they are as much an improvement as others have said. Even if you wanted to post here if that's OK? I've done it in several different ways depending on the model but it is mostly about filling in the hole with sheet styrene, cutting out a new hole further forward and installing the guide adapter in the forward location. Before you start, make sure the inner body cavity at the front of your model has sufficient room for the forward mounted guide to rotate with the wires in place. Relieve that area as necessary. Don't worry so much about the depth of the barrel on the adapter itself. It can be trimmed away if it interferes with the axle or inner body. I prefer to do that after it is glued in place. Another word of note is that I like to use JB Weld as my adhesive of choice because it is strong and it can be filed and /or milled down with a dremel tool. I've joked to myself that if I made a proper mold, I could simply fill it up with JB Weld and have a fine chassis when done. I love the stuff for any structural bonding that I do. Here's a Carrera McLaren M20 with the guide adapter mounted in the stock location. Note the nice little notches for and aft. These mark the center line of the guide to help you align it in the chassis. Here's a Carrera McLaren M20 with the guide adapter mounted in a forward location, straight axle in place. Thanks for the pics now it makes sense to me, clever idea BTW and a nice job you did with that Mclaren. JB weld is my choice as well but you have to try Gorilla Glue for bonding as well, another great product. Now I will have to order some of these adaptors from bnova. Good to know I was thinking about picking up a pair of the capris, I know from modding my fly front engine to rear inline with a straight front axle what a difference it makes in handling. I'd like to do my morgan aeromax first so I will have to order some. Thanks again for the write up, much appreciated. I converted a Carrera Willys using a GM-2 this afternoon. Easy, you just need to make sure the wiring loom is taped up right and run the guide wires under (rather than over) the front axle. Also you need to cut down the bracket for the front lights. This is my dad's car and he likes the lights. The car needs a wheel and tyre change though. Sorry I didn't take any photos while it was apart, but eyelets and braids are Slot.It, while the guide is an unmodified Sloting Plus standard screw-fit type. Last edited by dw5555; 09-27-2012, 10:17 AM.